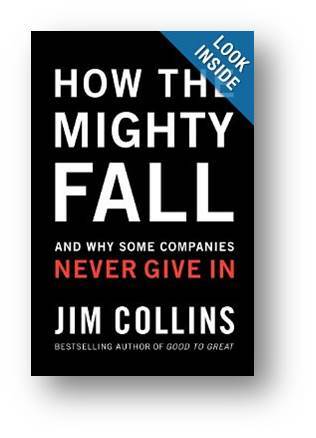 In How the Mighty Fall, And Why Some Companies Never Given In, Jim Collins asks: How do once-great companies fall into decline? Amazingly, the answer was not complacency. In fact they found that over-reaching is far more likely to tip a company into decline than complacency. Collins and his team studied 11 companies that once ranked as great and then disappeared or fell into irrelevance. As in prior studies, they compared each company with a comparable one of a similar age and size, in the same business, with similar prior performance, that prospered during same period. The companies that fell did so during periods of intense innovation. HP doubled its patent filings even in the midst of its decline. Rubbermaid was striving to be more innovative than 3M and Apple, drowning in hundreds of new product innovations every year. Indeed, the book includes an appendix listing all of the game-changing innovations underway as these companies bit the dust. Execution has been a hot topic in leadership literature and practice over the past decade. We tend to associate it with discipline, commitment and decisiveness. Yet on another level, execution is about integrity. Quite literally, it means following through on decisions you have made, doing what you said you would do. It means delivering on the brand promises you make to a customer, the process improvements, technologies, or acquisitions that allow you to fulfill your strategy for shareholders, following through on the programs and policies that impact growth, safety, corporate responsibility, and so on. So when Collins describes companies over-reaching, promising more than they can deliver, spreading leadership attention and processes too thin, basically what he is saying is that these organizations are setting themselves up to compromise. For example, when Circuit City lays off its most knowledgeable staff, how do the remaining sales people fulfill the brand promise of superior service? When Merck makes growth its #1 objective, how do the teams working on Vioxx reconcile that with the company values about profits that serve humanity? According to Collins, one of the earliest indicators of a company in decline is the number of key seats not filled by the right players. But even before that, chances are your star performers are trying to warn you about unhealthy compromises that threaten the company’s reputation and relationships. On the surface, these employees may appear to be simply resistors of change. But Collins emphasizes that company’s need discipline and a willingness not to change at times. For example, he says, We’ve found in all our research that those who resisted the pressures to succumb to unsustainable short-term growth delivered better long-term results by Wall Street’s own definition of success, namely cumulative returns to investors. All Good to Great and Built to Last companies have systems for preserving the core, for balancing the tension between change and continuity. Can your staff say no to what erodes the core of your business? Do you bring enough reality-on-the-ground into decision-making processes? Can those who make promises know what the organization is capable of delivering? Are past promises considered when making decisions? In a sense, your employees’ concerns are an “early warning system” to help you get stay on track. But to get the benefit, you need to respect those who have the courage to speak up when a core value, asset or competency is at stake. Sources: Jim Collins, How the Mighty Fall and Why Some Companies Never Give In (New York: HarperCollins, 2006) pp 32, 38, 52, 54. This entry was posted in Strong Commitments and tagged compromise, heroics, Over-promising. Bookmark the permalink.